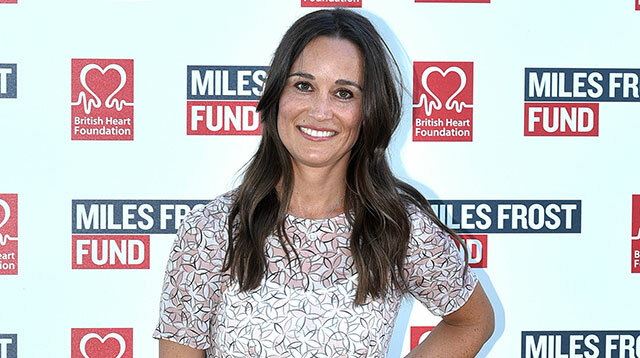 Pippa Middleton had some happy news yesterday morning, as it emerged that she is engaged to her banker boyfriend James Matthews—aka the brother of Made In Chelsea's Spencer Matthews. Thankfully, the older Middleton sister didn't make us wait that long before we could get a proper peek at her engagement ring, as she stepped out of her London home on Wednesday morning, beaming for waiting photographers. Zooming in on Pippa's new bling gives us the opportunity to see this impressive piece of jewelery up close. James selected a vintage-looking ring for Pippa, picking a HUGE square-cut diamond surrounded by smaller (but still huge) diamonds in a halo shape. When photographers asked Pippa how she was feeling, she replied she "couldn't be happier," which, let's face it, is kind of apparent from the smile plastered all over her face. We love that Pippa decided to wear white on the morning of her engagement news—better get used to the color early on, right? We're also super excited to see what she wears down the aisle. Will Kate Middleton be her Maid of Honor? Will she wear white, too? Will people talk about their butts?! Either way, it sounds like Pippa's family is very excited for their daughter's engagement news. "James is a traditionalist and very much wanted to do things properly. That meant getting his future father in law's consent," a friend of the couple told the MailOnline. Another family friend added: "Mike and Carole (Pippa's parents) are very happy. They like James and they are sure he will make Pippa very happy."